I like to play around with the sponge dough method for bread making. 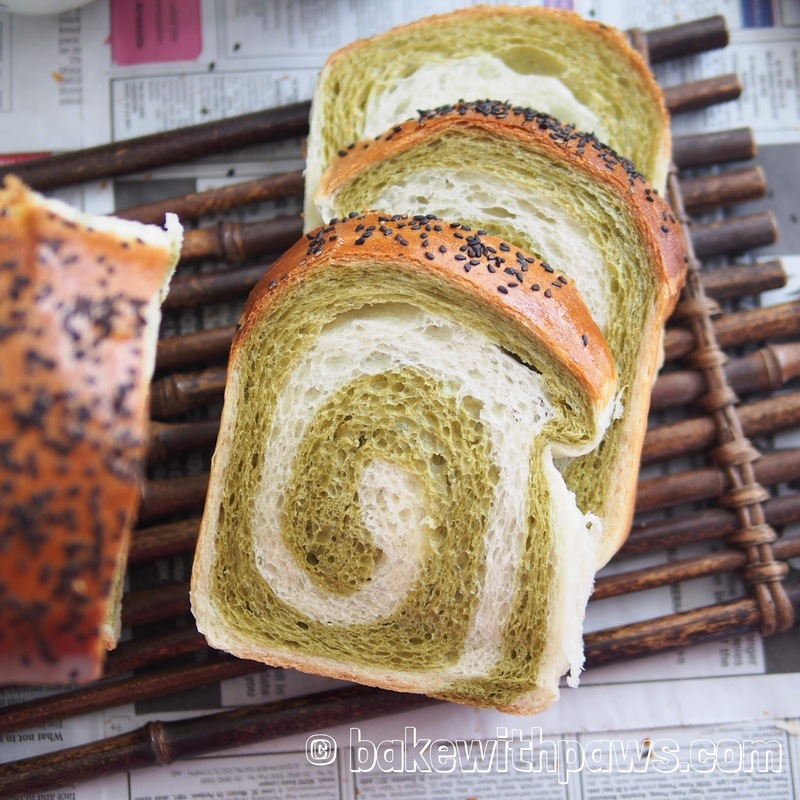 This time, I used more sponge dough (ratio 1:1) to make this beautiful and soft Matcha Swirl bread. The result is not much difference to the sponge dough method recipes (ratio 3:7) I shared previously. To be honest, the green tea powder didn’t give much flavour. However, it looks pretty as a combination of two colours. After 1 hour, place into the refrigerator and use the next day at least after 8 hours or up to 16 hours. 30 minutes before using, take out the sponge dough from refrigerator to return to room temperature. Put all ingredients (start with salt, flour, yeast, sugar, milk powder, butter, cooking cream and sponge dough (tear into few pieces)) into the bowl of stand mixer. Using the dough hook on a stand mixer, knead until the dough comes together, become elastic and tacky but not sticky. Tacky dough behaves sort of like a Post-it note, sticking to a surface but peeling off easily. It takes around 12 - 15 minutes at medium speed. 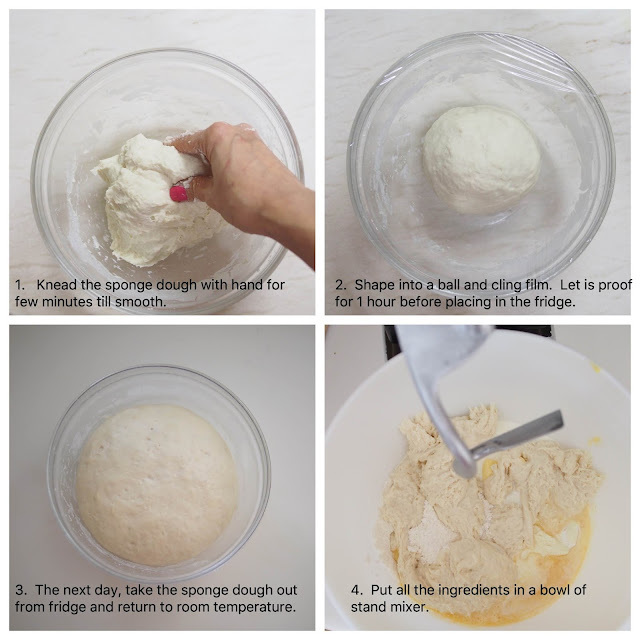 If the dough is too dry, add 1 tablespoon of water or cooking cream at a time. After kneading, divide dough into 2 equal portions. One portion leave in a bowl. 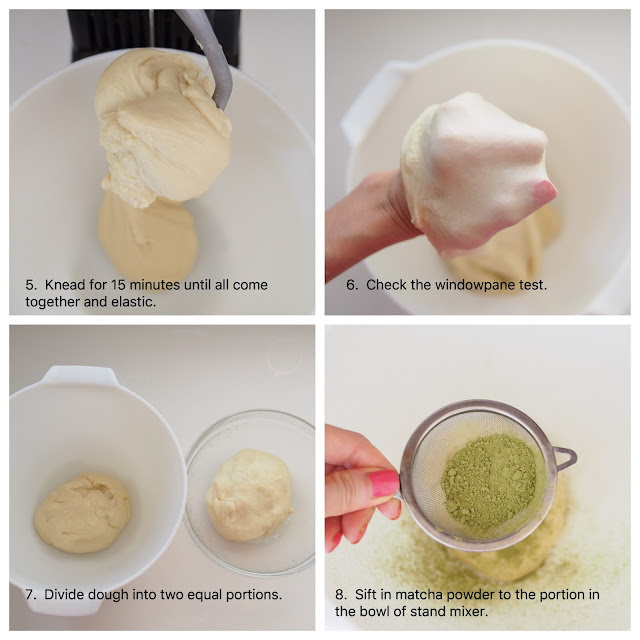 Return another portion into the bowl of stand mixer and sift in matcha/green tea powder. Knead again at medium speed until well mixed. 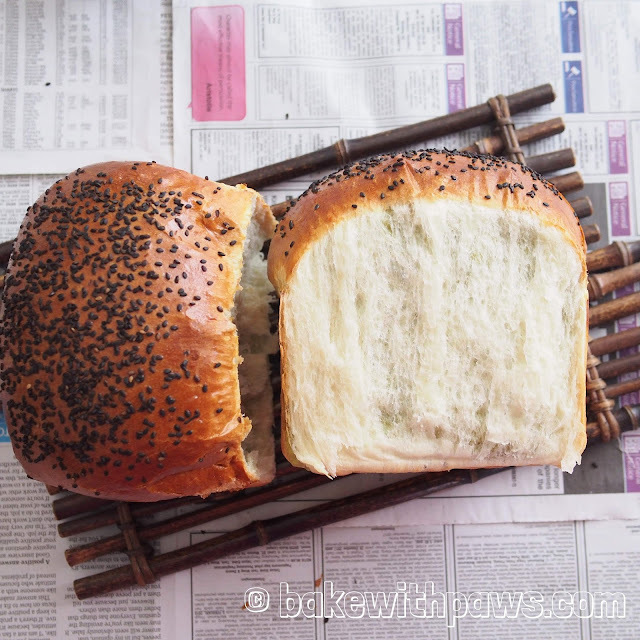 Let the doughs rise in a warm place for 60 minutes or until double in size in a large greased bowl, covered with cling film or kitchen towel. I normally left it inside the oven (off) with a bowl of hot water. Punch down each dough to release the air individually. 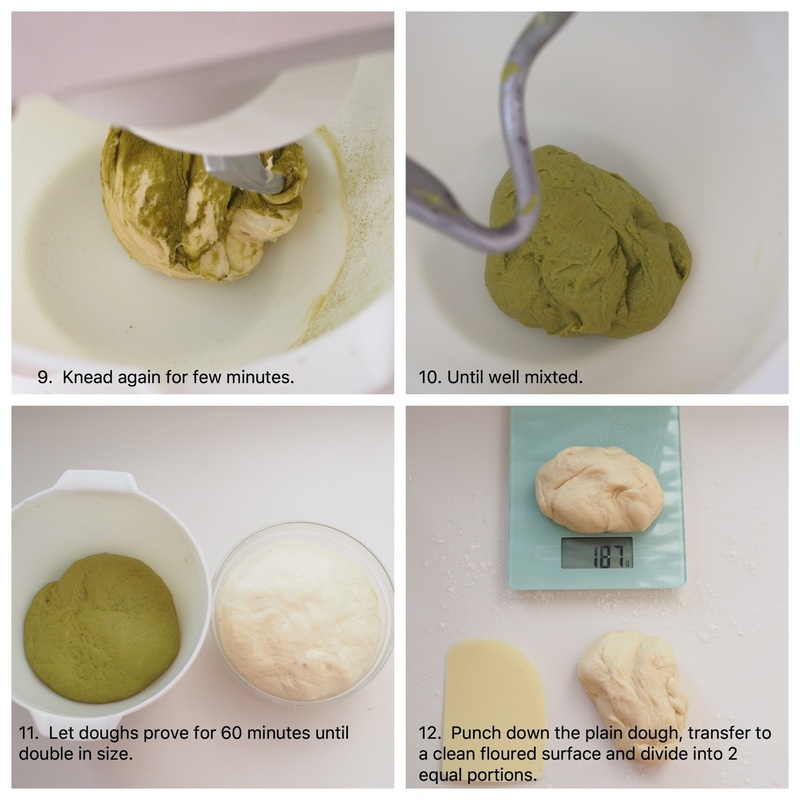 Transfer the plain dough to a clean floured surface then divide into 2 equal portions. 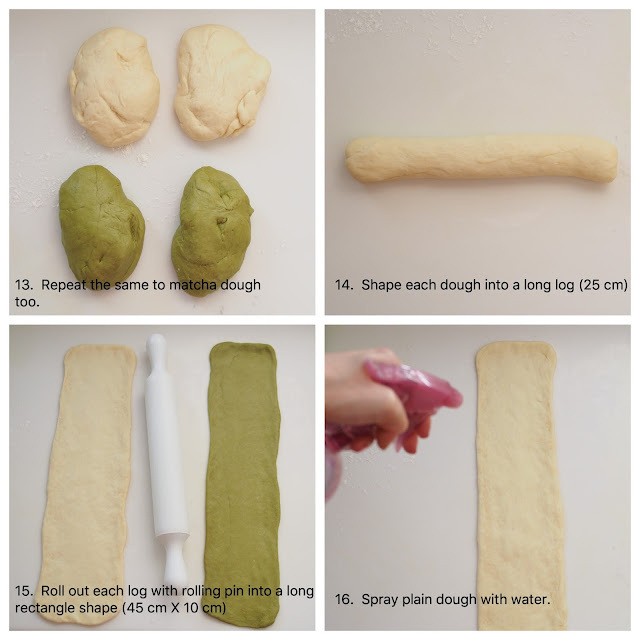 Shape each plain dough into a long log (25cm). Roll out each log with a rolling pin into long rectangle shape (45cm X 10 cm). Repeat the same to matcha dough. 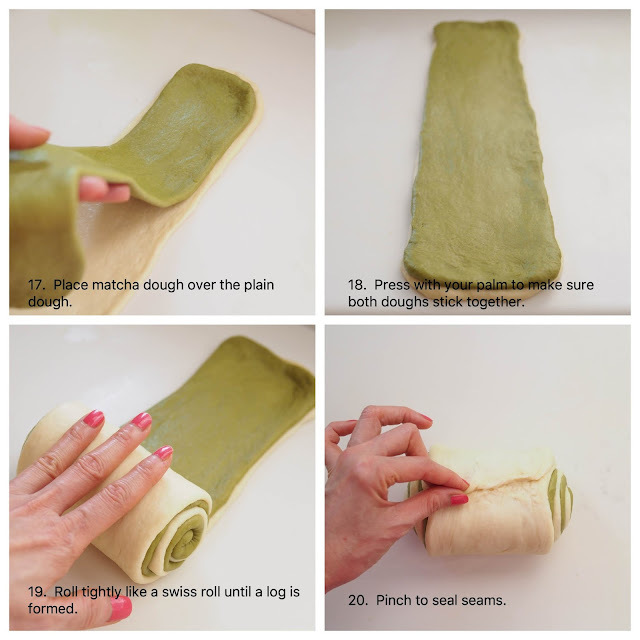 Spray water on the plain dough slightly and place the matcha dough over the plain dough. Press with palm to make sure both layers are stick together. Spray some water on matcha dough and roll up tightly like a swiss roll starting from the shorter side until a log is formed. Pinch to seal the seams. 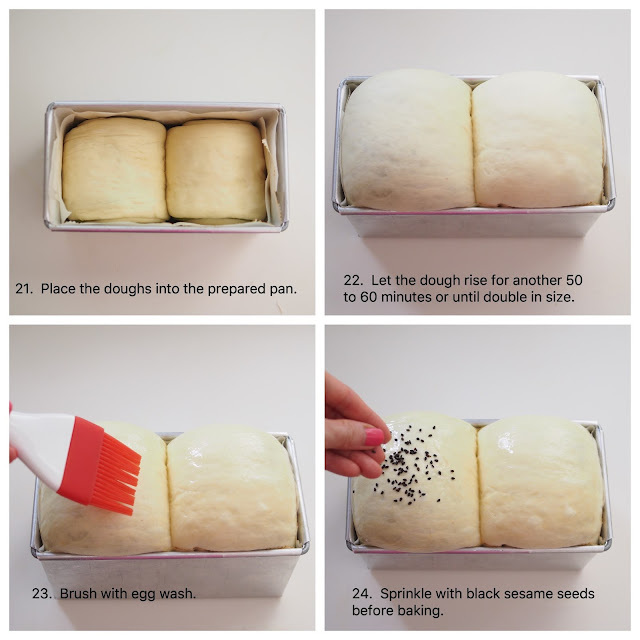 Place all the dough in prepared loaf pan. Let it rise for another 45 to 60 minutes or until double in size. 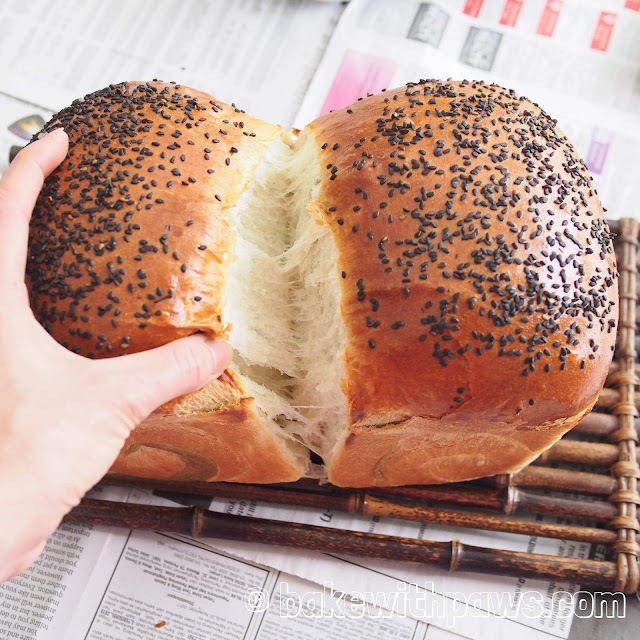 Brush top of the dough with egg wash and sprinkle some black sesame seeds. Bake at preheated oven for 25 - 30 minutes, or until golden brown. Thank you for your comment. My pleasure to share. Glad that you like it. Hello Yeanley, thanks for sharing the recipe, the bread looks beautiful. Would like to ask about yr pt.2 of the 'Main Dough", is "cooking cream" = 80-85g fresh milk? And if I would like to have pandan flavour (normally I get the juice from the pandan leaves) instead of matcha, any suggestions on how it could work?